Fourth in the Premier League table is the least we should expect from as talented a Tottenham team as I have seen since the golden years of the 1960s. I am always being asked by younger supporters just how this Spurs side compares with the great Lilywhite teams that graced White Hart Lane. 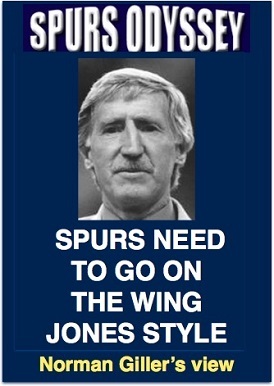 The Pochettino team is up there with the best, but I have to say that the Bill Nicholson Double side would have eaten Crystal Palace alive yesterday, simply because they featured two orthodox wingers in Cliff Jones and Terry Dyson. They would have been attacking down the flanks and turning the Palace full backs inside out. It was left to Tottenham full backs Serge Aurier and Ben Davies to give the attack width, and too many of their crosses were easily gobbled up by the Palace defenders. Palace did not just park the bus but closed the gates and padlocked them. I know they are desperate for survival points, but this sort of negative football at home would not be tolerated by Spurs supporters. I found myself wondering why Woy did not use these stifling tactics against Iceland! I got the feeling that Hugo Lloris and I were the only two people who were not in the Palace half. It was more crowded than Piccadilly at rush hour, and it screamed out for old-school wingers to give Tottenham much-needed thrust. Even in his 80s I would have backed Cliff Jones to open the way to goal. If you were not lucky enough to have seen him play, you missed one of the most exciting sights in football when he was in full flight. I know that Cliff would have loved to lay the ball on a plate for the dynamic Harry Kane. He was unwell at Wembley recently when celebrating his 83rd birthday, but I am glad to report he is feeling much better and has been active at his local golf driving range. I want whatever he�s on! Our Harry�s headed goal against Palace � already the 150th of his career � was a late-late relief after a nail-biting 87 minutes that were hardly a good advertisement for the Beautiful Game. Our guru Paul H. Smith describes the action HERE, and must have needed extra pages in his notebook to capture the Spurs chances that went begging. All focus must now be on Wednesday�s fifth round FA Cup replay against Rochdale. It looks easy on paper, but with the Siberian blast expected to hit Wembley it may not be so simple on the pitch. The Spurs medical staff will make an assessment of Jan Vertonghen�s injury today. How lucky Tottenham (and England) are to have a utility player like Eric Dier to fill virtually any defensive position. His skill and application epitomises this current Spurs side. Sheer class. The FA Cup is now wide open, and I hope Pochettino treats it with the concentration it deserves. I get the feeling he is obsessed with the Champions� League and does not quite understand how the FA Cup is in Tottenham�s DNA. I would like to see him start with his strongest possible side against Rochdale, and then send on the shadow squad once a quarter-final place has been clinched. Cliff Jones-style raids down the wing would be particularly appreciated by this old hack. He was a joy to behold. WEEK 28 of the Sports Odyssey Quiz League 2017-18. The rules are simple: I ask one Tottenham-related question for which a right answer earns you two points, and then a related teaser that can bring you an extra point. Which Spurs right-back played 32 matches for England, captained them three times and won a League championship medal? From which club did he join Tottenham? Please email your answers by Friday�s midnight deadline to: soql28@normangillerbooks.com. Question 27 was: Who was born in Enfield, won 11 England Under 21 caps and joined Tottenham from Coventry? What number shirt did he win in an FA Cup final appearance for Spurs? All the SOQL table leaders were correct with the answer: Steve Sedgley, who wore the No 4 shirt in the 1991 FA Cup final victory over Forest, That was the last time Spurs were in an FA Cup Final. That is too long ago. Time to write some more history. First name drawn from the correct answers: Dave Webber, who lives in Enfield and has followed Spurs since 1955. I will send Dave a screen version of my Spurs �67 book (I have now sold all copies, and the book raised �4,000 for the Tottenham Tribute Trust to help our old heroes Thank you all those Spurs Odyssey followers who gave their support).